भारत (whose territory at that time, before the Partition of India, also included the present-day territories of Pakistan and Bangladesh) was under British colonial rule, until gaining full independence in 1947. The alphabetical order by the member states' official designations is used to determine the seating arrangement of the General Assembly sessions, where a draw is held each year to select a member state as the starting point. Several members use their full official names in their official designations and thus are sorted out of order from their common names: the Democratic People's Republic of Korea, the Democratic Republic of the Congo, the Republic of Korea, the Republic of Moldova, The former Yugoslav Republic of Macedonia (a provisional reference used for all purposes within the UN, and listed under T), and the United Republic of Tanzania. Albania 000000001955-12-14-000014 दिसंबर 1955 ~ ! Algeria 000000001962-10-08-00008 अक्टूबर 1962 ~ ! Andorra 000000001993-07-28-000028 जुलाई 1993 ~ ! Angola 000000001976-12-01-00001 दिसंबर 1976 ~ ! Antigua and Barbuda 000000001981-11-11-000011 नवंबर 1981 ~ ! Argentina 000000001945-10-24-000024 अक्टूबर 1945 ~ ! Austria 000000001955-12-14-000014 दिसंबर 1955 ~ ! Bahamas 000000001973-09-18-000018 सितंबर 1973 ~ ! Bahrain 000000001971-09-21-000021 सितंबर 1971 ~ ! Bangladesh 000000001974-09-17-000017 सितंबर 1974 ~ ! Barbados 000000001966-12-09-00009 दिसंबर 1966 ~ ! Belgium 000000001945-12-27-000027 दिसंबर 1945 ~ ! Belize 000000001981-09-25-000025 सितंबर 1981 ~ ! Benin[note 1] 000000001960-09-20-000020 सितंबर 1960 ~ ! Bhutan 000000001971-09-21-000021 सितंबर 1971 ~ ! Bolivia (Plurinational State of)[note 2] 000000001945-11-14-000014 नवंबर 1945 ~ ! Botswana 000000001966-10-17-000017 अक्टूबर 1966 ~ ! Brunei Darussalam 000000001984-09-21-000021 सितंबर 1984 ~ ! Bulgaria 000000001955-12-14-000014 दिसंबर 1955 ~ ! Burkina Faso[note 3] 000000001960-09-20-000020 सितंबर 1960 ~ ! Burundi 000000001962-09-18-000018 सितंबर 1962 ~ ! Cabo Verde[note 4] 000000001975-09-16-000016 सितंबर 1975 ~ ! Cambodia[note 5] 000000001955-12-14-000014 दिसंबर 1955 ~ ! Cameroon[note 6] 000000001960-09-20-000020 सितंबर 1960 ~ ! Central African Republic[note 7] 000000001960-09-20-000020 सितंबर 1960 ~ ! Chad 000000001960-09-20-000020 सितंबर 1960 ~ ! Chile 000000001945-10-24-000024 अक्टूबर 1945 ~ ! Colombia 000000001945-11-05-00005 नवंबर 1945 ~ ! Comoros 000000001975-11-12-000012 नवंबर 1975 ~ ! Congo[note 8] 000000001960-09-20-000020 सितंबर 1960 ~ ! Costa Rica 000000001945-11-02-00002 नवंबर 1945 ~ ! Côte d'Ivoire[note 9] 000000001960-09-20-000020 सितंबर 1960 ~ ! Cuba 000000001945-10-24-000024 अक्टूबर 1945 ~ ! Cyprus 000000001960-09-20-000020 सितंबर 1960 ~ ! Democratic Republic of the Congo[note 10] 000000001960-09-20-000020 सितंबर 1960 ~ ! Denmark 000000001945-10-24-000024 अक्टूबर 1945 ~ ! Djibouti 000000001977-09-20-000020 सितंबर 1977 ~ ! Dominica 000000001978-12-18-000018 दिसंबर 1978 ~ ! Dominican Republic 000000001945-10-24-000024 अक्टूबर 1945 ~ ! Ecuador 000000001945-12-21-000021 दिसंबर 1945 ~ ! El Salvador 000000001945-10-24-000024 अक्टूबर 1945 ~ ! Equatorial Guinea 000000001968-11-12-000012 नवंबर 1968 ~ ! Eritrea 000000001993-05-28-000028 मई 1993 ~ ! Ethiopia 000000001945-11-13-000013 नवंबर 1945 ~ ! Finland 000000001955-12-14-000014 दिसंबर 1955 ~ ! Gabon 000000001960-09-20-000020 सितंबर 1960 ~ ! Gambia[note 11] 000000001965-09-21-000021 सितंबर 1965 ~ ! Ghana 000000001957-03-08-00008 मार्च 1957 ~ ! Greece 000000001945-10-25-000025 अक्टूबर 1945 ~ ! Grenada 000000001974-09-17-000017 सितंबर 1974 ~ ! Guatemala 000000001945-11-21-000021 नवंबर 1945 ~ ! Guinea 000000001958-12-12-000012 दिसंबर 1958 ~ ! Guinea-Bissau 000000001974-09-17-000017 सितंबर 1974 ~ ! Guyana 000000001966-09-20-000020 सितंबर 1966 ~ ! Haiti 000000001945-10-24-000024 अक्टूबर 1945 ~ ! Honduras 000000001945-12-17-000017 दिसंबर 1945 ~ ! Hungary 000000001955-12-14-000014 दिसंबर 1955 ~ ! Iceland 000000001946-11-19-000019 नवंबर 1946 ~ ! Iran (Islamic Republic of)[note 13] 000000001945-10-24-000024 अक्टूबर 1945 ~ ! Iraq 000000001945-12-21-000021 दिसंबर 1945 ~ ! Ireland 000000001955-12-14-000014 दिसंबर 1955 ~ ! Italy 000000001955-12-14-000014 दिसंबर 1955 ~ ! Jamaica 000000001962-09-18-000018 सितंबर 1962 ~ ! Jordan 000000001955-12-14-000014 दिसंबर 1955 ~ ! Kenya 000000001963-12-16-000016 दिसंबर 1963 ~ ! Kiribati 000000001999-09-14-000014 सितंबर 1999 ~ ! Kuwait 000000001963-05-14-000014 मई 1963 ~ ! Lao People's Democratic Republic[note 15] 000000001955-12-14-000014 दिसंबर 1955 ~ ! Lebanon 000000001945-10-24-000024 अक्टूबर 1945 ~ ! Lesotho 000000001966-10-17-000017 अक्टूबर 1966 ~ ! Liberia 000000001945-11-02-00002 नवंबर 1945 ~ ! Libya[note 16] 000000001955-12-14-000014 दिसंबर 1955 ~ ! Liechtenstein 000000001990-09-18-000018 सितंबर 1990 ~ ! Madagascar[note 17] 000000001960-09-20-000020 सितंबर 1960 ~ ! Malawi 000000001964-12-01-00001 दिसंबर 1964 ~ ! Maldives[note 18] 000000001965-09-21-000021 सितंबर 1965 ~ ! Mali 000000001960-09-28-000028 सितंबर 1960 ~ ! Malta 000000001964-12-01-00001 दिसंबर 1964 ~ ! Mauritania 000000001961-10-27-000027 अक्टूबर 1961 ~ ! Mauritius 000000001968-04-24-000024 अप्रैल 1968 ~ ! Monaco 000000001993-05-28-000028 मई 1993 ~ ! Mongolia 000000001961-10-27-000027 अक्टूबर 1961 ~ ! Morocco 000000001956-11-12-000012 नवंबर 1956 ~ ! Mozambique 000000001975-09-16-000016 सितंबर 1975 ~ ! Myanmar[note 19] 000000001948-04-19-000019 अप्रैल 1948 ~ ! Namibia 000000001990-04-23-000023 अप्रैल 1990 ~ ! Nauru 000000001999-09-14-000014 सितंबर 1999 ~ ! Nepal 000000001955-12-14-000014 दिसंबर 1955 ~ ! Netherlands 000000001945-12-10-000010 दिसंबर 1945 ~ ! Nicaragua 000000001945-10-24-000024 अक्टूबर 1945 ~ ! Niger 000000001960-09-20-000020 सितंबर 1960 ~ ! Nigeria 000000001960-10-07-00007 अक्टूबर 1960 ~ ! Norway 000000001945-11-27-000027 नवंबर 1945 ~ ! Oman 000000001971-10-07-00007 अक्टूबर 1971 ~ ! Palau 000000001994-12-15-000015 दिसंबर 1994 ~ ! Panama 000000001945-11-13-000013 नवंबर 1945 ~ ! Papua New Guinea 000000001975-10-10-000010 अक्टूबर 1975 ~ ! Paraguay 000000001945-10-24-000024 अक्टूबर 1945 ~ ! Peru 000000001945-10-31-000031 अक्टूबर 1945 ~ ! Poland 000000001945-10-24-000024 अक्टूबर 1945 ~ ! Portugal 000000001955-12-14-000014 दिसंबर 1955 ~ ! Qatar 000000001971-09-21-000021 सितंबर 1971 ~ ! Romania 000000001955-12-14-000014 दिसंबर 1955 ~ ! Rwanda 000000001962-09-18-000018 सितंबर 1962 ~ ! Saint Kitts and Nevis[note 22] 000000001983-09-23-000023 सितंबर 1983 ~ ! Saint Lucia 000000001979-09-18-000018 सितंबर 1979 ~ ! Saint Vincent and the Grenadines 000000001980-09-16-000016 सितंबर 1980 ~ ! Samoa 000000001976-12-15-000015 दिसंबर 1976 ~ ! San Marino 000000001992-03-02-00002 मार्च 1992 ~ ! São Tomé and Príncipe[note 23] 000000001975-09-16-000016 सितंबर 1975 ~ ! Saudi Arabia 000000001945-10-24-000024 अक्टूबर 1945 ~ ! Senegal 000000001960-09-28-000028 सितंबर 1960 ~ ! Seychelles 000000001976-09-21-000021 सितंबर 1976 ~ ! Sierra Leone 000000001961-09-27-000027 सितंबर 1961 ~ ! Solomon Islands 000000001978-09-19-000019 सितंबर 1978 ~ ! Somalia 000000001960-09-20-000020 सितंबर 1960 ~ ! South Africa[note 24] 000000001945-11-07-00007 नवंबर 1945 ~ ! South Sudan 000000002011-07-14-000014 जुलाई 2011 ~ ! Spain 000000001955-12-14-000014 दिसंबर 1955 ~ ! Sri Lanka[note 25] 000000001955-12-14-000014 दिसंबर 1955 ~ ! Sudan 000000001956-11-12-000012 नवंबर 1956 ~ ! Suriname[note 26] 000000001975-12-04-00004 दिसंबर 1975 ~ ! Swaziland 000000001968-09-24-000024 सितंबर 1968 ~ ! Sweden 000000001946-11-19-000019 नवंबर 1946 ~ ! Switzerland 000000002002-09-10-000010 सितंबर 2002 ~ ! Thailand[note 27] 000000001946-12-16-000016 दिसंबर 1946 ~ ! Timor-Leste 000000002002-09-27-000027 सितंबर 2002 ~ ! Togo 000000001960-09-20-000020 सितंबर 1960 ~ ! Tonga 000000001999-09-14-000014 सितंबर 1999 ~ ! Tunisia 000000001956-11-12-000012 नवंबर 1956 ~ ! Turkey 000000001945-10-24-000024 अक्टूबर 1945 ~ ! Uganda 000000001962-10-25-000025 अक्टूबर 1962 ~ ! United Arab Emirates 000000001971-12-09-00009 दिसंबर 1971 ~ ! Uruguay 000000001945-12-18-000018 दिसंबर 1945 ~ ! Venezuela (Bolivarian Republic of)[note 28] 000000001945-11-15-000015 नवंबर 1945 ~ ! Vietnam 000000001977-09-20-000020 सितंबर 1977 ~ ! Zambia 000000001964-12-01-00001 दिसंबर 1964 ~ ! Zimbabwe 000000001980-08-25-000025 अगस्त 1980 ~ ! The Republic of China (ROC) joined the UN as an original member on 24 October 1945, and as set out by the United Nations Charter, Chapter V, Article 23, became one of the five permanent members of the United Nations Security Council. In 1949, as a result of the Chinese Civil War, the Kuomintang-led ROC government lost effective control of mainland China and relocated to the island of Taiwan, and the Communist Party-led government of the People's Republic of China (PRC), declared on 1 October 1949, took control of mainland China. The UN was notified on 18 November 1949 of the formation of the Central People's Government of the People's Republic of China; however, the Government of the Republic of China continued to represent China at the UN, despite the small size of the ROC's jurisdiction of Taiwan and a number of smaller islands compared to the PRC's jurisdiction of mainland China. As both governments claimed to be the sole legitimate representative of China, proposals to effect a change in the representation of China in the UN were discussed but rejected for the next two decades, as the ROC was still recognized as the sole legitimate representative of China by a majority of UN members. [प्रमाण देईं] Both sides rejected compromise proposals to allow both states to participate in the UN, based on the One-China policy. Every year from 1993–2006, UN member states submitted a memorandum to the UN Secretary-General requesting that the UN General Assembly consider allowing the ROC to resume participating in the United Nations. This approach was chosen, rather than a formal application for membership, because it could be enacted by the General Assembly, while a membership application would need Security Council approval, where the PRC held a veto. Early proposals recommended admitting the ROC with parallel representation over China, along with the People's Republic of China, pending eventual reunification, citing examples of other divided countries which had become separate UN member states, such as East and West Germany and North and South Korea. 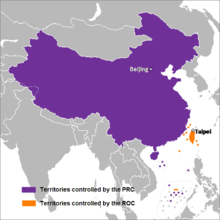 Later proposals emphasized that the ROC was a separate state, over which the PRC had no effective sovereignty. 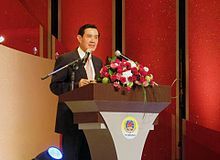 These proposed resolutions referred to the ROC under a variety of names: "Republic of China in Taiwan" (1993–94), "Republic of China on Taiwan" (1995–97, 1999–2002), "Republic of China" (1998), "Republic of China (Taiwan)" (2003) and "Taiwan" (2004–06). The Republic of China is officially recognized by 21 UN member states and the Holy See. It maintains unofficial diplomatic relations with around 100 nations, including the United States and Japan. Czechoslovakia joined the UN as an original member on 24 October 1945, with its name changed to the Czech and Slovak Federative Republic on 20 April 1990. Upon the imminent dissolution of Czechoslovakia, in a letter dated 10 December 1992, its Permanent Representative informed the United Nations Secretary-General that the Czech and Slovak Federative Republic would cease to exist on 31 December 1992 and that the Czech Republic and Slovakia, as successor states, would apply for membership in the UN. Neither state sought sole successor state status. Both states were admitted to the UN on 19 January 1993. 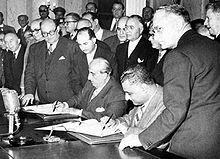 Macedonia was admitted to the UN on 8 April 1993, being provisionally referred to for all purposes within the UN as "The former Yugoslav Republic of Macedonia" pending settlement of the difference that had arisen over its name. On the basis of a referendum held on 21 May 2006, Montenegro declared independence from Serbia and Montenegro on 3 जून 2006. In a letter dated on the same day, the President of Serbia informed the United Nations Secretary-General that the membership of Serbia and Montenegro in the UN was being continued by Serbia, following Montenegro's declaration of independence, in accordance with the Constitutional Charter of Serbia and Montenegro. Montenegro was admitted to the UN on 28 जून 2006. In the aftermath of the Kosovo War, the territory of Kosovo, then an autonomous province of the Federal Republic of Yugoslavia, was put under the interim administration of the United Nations Mission in Kosovo on 10 June 1999. On 17 February 2008 it declared independence, but this has not been recognised by Serbia. The Republic of Kosovo is not a member of the UN, but is a member of the International Monetary Fund and the World Bank Group, both specialized agencies in the United Nations System. The Republic of Kosovo is recognised by 108 UN member states, including three of the five permanent members of the United Nations Security Council (France, the United Kingdom, and the United States), while the other two—China and Russia—do not recognise Kosovo. On 22 July 2010, the International Court of Justice, the primary judicial organ of the UN, issued an advisory opinion, ruling that Kosovo's declaration of independence was not in violation of international law. The Palestine Liberation Organization was granted observer status as a "non-member entity" on 22 November 1974. Acknowledging the proclamation of the State of Palestine by the Palestine National Council on 15 November 1988, the United Nations General Assembly decided that, effective as of 15 December 1988, the designation "Palestine" should be used in place of the designation "Palestine Liberation Organization" in the United Nations System. On 23 September 2011, Palestinian National Authority President Mahmoud Abbas submitted the application for UN membership for the State of Palestine to United Nations Secretary-General Ban Ki-moon; the application has not been voted on by the UN Security Council. On 31 अक्टूबर 2011, the General Assembly of UNESCO voted to admit Palestine as a member, becoming the first UN agency to admit Palestine as a full member. The State of Palestine was recognized as a "non-member state" on 29 November 2012, when the UN General Assembly passed United Nations General Assembly resolution 67/19 by a vote of 138 to 9, with 41 abstentions. The change in status was described by The Independent as "de facto recognition of the sovereign state of Palestine". On 17 December 2012, UN Chief of Protocol Yeocheol Yoon decided that "the designation of 'State of Palestine' shall be used by the Secretariat in all official United Nations documents". ↑ Cabo Verde: Previously referred to as Cape Verde. On 24 अक्टूबर 2013, Cabo Verde requested that its name no longer be translated into different languages. ↑ Côte d'Ivoire: Previously referred to as Ivory Coast. On 6 November 1985, Côte d'Ivoire requested that its name no longer be translated into different languages; this became fully effective on 1 January 1986. ↑ Withdrew from the UN on 20 January 1965. It rejoined on 28 September 1966. ↑ 3.0 3.1 3.2 "Charter of the United Nations, Chapter II: Membership". United Nations. ↑ 5.0 5.1 "Growth in United Nations membership, 1945–present". United Nations. ↑ 8.0 8.1 8.2 8.3 "CHAPTER I – CHARTER OF THE UNITED NATIONS AND STATUTE OF THE INTERNATIONAL COURT OF JUSTICE". United Nations. पहुँचतिथी 2015-10-07. ↑ John Wilson (अगस्त 2007). "New Zealand Sovereignty: 1857, 1907, 1947, or 1987?". New Zealand Parliament. ओरिजनल से 22 May 2011 के पुरालेखित. ↑ "Blue Book "Permanent Missions to the United Nations No. 306"" (PDF). United Nations. जून 2016. ↑ "Thailand's name picked to set seating arrangement for General Assembly session". United Nations. 2 अगस्त 2005. ↑ "CHAPTER I – CHARTER OF THE UNITED NATIONS AND STATUTE OF THE INTERNATIONAL COURT OF JUSTICE". United Nations. पहुँचतिथी 2015-10-07. ↑ "Change of name – Cape Verde" (PDF). United Nations. 29 अक्टूबर 2013. ओरिजनल (PDF) से 2 January 2014 के पुरालेखित. पहुँचतिथी 2 January 2014. ↑ Lederer, Edith M. (16 September 2011). "UN approves Libya seat for former rebels". Google News. Associated Press. पहुँचतिथी 16 September 2011. ↑ 17.0 17.1 "Charter of the United Nations, Chapter V: The Security Council". United Nations. ↑ Winkler, Sigrid (जून 2012). "Taiwan's UN Dilemma: To Be or Not To Be". Brookings Institution. पहुँचतिथी 2016-04-25. ↑ "1971 Year in Review: Red China Admitted to UN". United Press International. 1971. ↑ United Nations General Assembly Session 26 Resolution 2758. Restoration of the lawful rights of the People's Republic of China in the United Nations A/RES/2758(XXVI) page 1. 25 October 1971. Retrieved 2016-04-24. ↑ "FINAL CLAUSES OF MULTILATERAL TREATIES" (PDF). United Nations. 2003. पहुँचतिथी 2016-04-25. Hence, instruments received from the Taiwan Province of China will not be accepted by the Secretary-General in his capacity as depositary. ↑ 22.0 22.1 Lindemann, Björn Alexander (2014). Cross-Strait Relations and International Organizations: Taiwan’s Participation in IGOs in the Context of Its Relationship with China. Springer Science+Business Media. प. 258. ↑ United Nations General Assembly Session 48 Agenda item REQUEST FOR THE INCLUSION OF A SUPPLEMENTARY ITEM IN THE AGENDA OF THE FORTY-EIGHTH SESSION CONSIDERATION OF THE EXCEPTIONAL SITUATION OF THE REPUBLIC OF CHINA IN TAIWAN IN THE INTERNATIONAL CONTEXT, BASED ON THE PRINCIPLE OF UNIVERSALITY AND IN ACCORDANCE WITH THE ESTABLISHED MODEL OF PARALLEL REPRESENTATION OF DIVIDED COUNTRIES AT THE UNITED NATIONS A/48/191 1993-08-09. Retrieved 2016-04-18. United Nations General Assembly Session 49 Agenda item REQUEST FOR THE INCLUSION OF AN ITEM IN THE PROVISIONAL AGENDA OF THE FORTY-NINTH SESSION CONSIDERATION OF THE EXCEPTIONAL SITUATION OF THE REPUBLIC OF CHINA IN TAIWAN IN THE INTERNATIONAL CONTEXT, BASED ON THE PRINCIPLE OF UNIVERSALITY AND IN ACCORDANCE WITH THE ESTABLISHED MODEL OF PARALLEL REPRESENTATION OF DIVIDED COUNTRIES AT THE UNITED NATIONS A/49/144 1994-07-19. Retrieved 2016-04-18. United Nations General Assembly Session 50 Agenda item REQUEST FOR THE INCLUSION OF AN ITEM IN THE PROVISIONAL AGENDA OF THE FIFTIETH SESSION CONSIDERATION OF THE EXCEPTIONAL SITUATION OF THE REPUBLIC OF CHINA ON TAIWAN IN THE INTERNATIONAL CONTEXT, BASED ON THE PRINCIPLE OF UNIVERSALITY AND IN ACCORDANCE WITH THE ESTABLISHED MODEL OF PARALLEL REPRESENTATION OF DIVIDED COUNTRIES AT THE UNITED NATIONS A/50/145 1995-07-19. Retrieved 2016-04-18. United Nations General Assembly Session 51 Agenda item REQUEST FOR THE INCLUSION OF AN ITEM IN THE PROVISIONAL AGENDA OF THE FIFTY-FIRST SESSION CONSIDERATION OF THE EXCEPTIONAL SITUATION OF THE INABILITY, RESULTING FROM GENERAL ASSEMBLY RESOLUTION 2758 (XXVI), OF THE 21.3 MILLION PEOPLE ON TAIWAN, REPUBLIC OF CHINA, TO PARTICIPATE IN THE ACTIVITIES OF THE UNITED NATIONS A/51/142 1996-07-18. Retrieved 2016-04-19. United Nations General Assembly Session 52 Agenda item REQUEST FOR THE INCLUSION OF AN ITEM IN THE PROVISIONAL AGENDA OF THE FIFTY-SECOND SESSION NEED TO REVIEW GENERAL ASSEMBLY RESOLUTION 2758 (XXVI) OF 25 OCTOBER 1971 OWING TO THE FUNDAMENTAL CHANGE IN THE INTERNATIONAL SITUATION AND TO THE COEXISTENCE OF TWO GOVERNMENTS ACROSS THE TAIWAN STRAIT A/52/143 1997-07-16. Retrieved 2016-04-19. United Nations General Assembly Session 53 Agenda item Request for the inclusion of an item in the provisional agenda of the fifty-third session Need to review General Assembly resolution 2758 (XXVI) of 25 October 1971 owing to the fundamental change in the international situation and to the coexistence of two Governments across the Taiwan Strait A/53/145 1998-07-08. Retrieved 2016-04-19. United Nations General Assembly Session 54 Agenda item Request for the inclusion of a supplementary item in the agenda of the fifty-fourth session Need to examine the exceptional international situation pertaining to the Republic of China on Taiwan, to ensure that the fundamental right of its twenty-two million people to participate in the work and activities of the United Nations is fully respected A/54/194 1999-08-12. Retrieved 2016-04-20. United Nations General Assembly Session 55 Agenda item Request for the inclusion of a supplementary item in the agenda of the fifty-fifth session Need to examine the exceptional international situation pertaining to the Republic of China on Taiwan, to ensure that the fundamental right of its twenty-three million people to participate in the work and activities of the United Nations is fully respected A/55/227 2000-08-04. Retrieved 2016-04-23. United Nations General Assembly Session 56 Agenda item Request for the inclusion of a supplementary item in the agenda of the fifty-sixth session Need to examine the exceptional international situation pertaining to the Republic of China on Taiwan, to ensure that the fundamental right of its twenty-three million people to participate in the work and activities of the United Nations is fully respected A/56/193 2001-08-08. Retrieved 2016-04-23. United Nations General Assembly Session 57 Agenda item Request for the inclusion of a supplementary item in the agenda of the fifty-seventh session Question of the representation of the Republic of China (Taiwan) in the United Nations A/57/191 2002-08-20. Retrieved 2016-04-23. United Nations General Assembly Session 58 Agenda item Request for the inclusion of a supplementary item in the agenda of the fifty-eighth session Question of the representation of the Republic of China (Taiwan) in the United Nations A/58/197 2003-08-05. Retrieved 2016-04-23. United Nations General Assembly Session 59 Agenda item Request for the inclusion of a supplementary item in the agenda of the fifty-ninth session Question of the representation of the twenty-three million people of Taiwan in the United Nations A/59/194 2004-08-10. Retrieved 2016-04-24. United Nations General Assembly Session 60 Agenda item Request for the inclusion of a supplementary item in the agenda of the sixtieth session Question of the representation of the twenty-three million people of Taiwan in the United Nations A/60/192 2005-08-11. Retrieved 2016-04-24. United Nations General Assembly Session 61 Agenda item Request for the inclusion of a supplementary item in the agenda of the sixty-first session Question of the representation and participation of the 23 million people of Taiwan in the United Nations A/61/194 2006-08-11. Retrieved 2016-04-24. ↑ 24.0 24.1 Damm, Jens; Lim, Paul (2012). European Perspectives on Taiwan. Springer Science+Business Media. पप. 160–63. By mid 2009, 16 applications for membership on behalf of Taiwan had been sent to the UN, but, in each of these cases, the General Assembly's General Committee, which sets the Assembly's agenda, decided against even raising the question during the Assembly's session. ↑ 25.0 25.1 United Nations General Assembly Session 62 Agenda item Request for the inclusion of a supplementary item in the agenda of the sixty-second session Urging the Security Council to process Taiwan’s membership application pursuant to rules 59 and 60 of the provisional rules of procedure of the Security Council and Article 4 of the Charter of the United Nations A/62/193 2007-08-17. Retrieved 2016-04-24. ↑ "Ban Ki-moon Convenes Largest-Ever Meeting of Global Leaders on Climate Change". United Nations. 24 September 2007. पहुँचतिथी 2017-06-08. ↑ "Talking points for Taiwan's UN Membership Application". Ministry of Foreign Affairs, Republic of China. ओरिजनल से 9 January 2009 के पुरालेखित. ↑ "President Chen Shui-bian's Letters to UN Secretary-General Ban Ki-moon and UN Security Council President Wang Guangya on July 31 (Office of the President)". Ministry of Foreign Affairs, Republic of China. ओरिजनल से 4 September 2009 के पुरालेखित. ↑ "China praises UN's rejection of Taiwan's application for membership". Xinhua News Agency. 24 July 2007. ओरिजनल से 11 January 2009 के पुरालेखित. ↑ United Nations General Assembly Session 63 Agenda item Request for the inclusion of a supplementary item in the agenda of the sixty-third session Need to examine the fundamental rights of the 23 million people of the Republic of China (Taiwan) to participate meaningfully in the activities of the United Nations specialized agencies A/63/194 2008-08-22. Retrieved 2016-04-24. ↑ "Not even asking". The Economist. 2009-09-24. पहुँचतिथी 2016-04-24. ↑ "Taiwan attends WHA as observer". United Press International. 18 May 2009. ↑ 35.0 35.1 35.2 35.3 35.4 35.5 35.6 35.7 35.8 "Yearbook of the United Nations". United Nations. ↑ Paul L. Montgomery (23 May 1992). "3 Ex-Yugoslav Republics Are Accepted into U.N." The New York Times. 29 July 2012 के ओरिजनल से पुरालेखित. पहुँचतिथी 29 July 2012. ↑ 38.0 38.1 "A Different Yugoslavia, 8 Years Later, Takes Its Seat at the U.N." The New York Times. 2 November 2000. 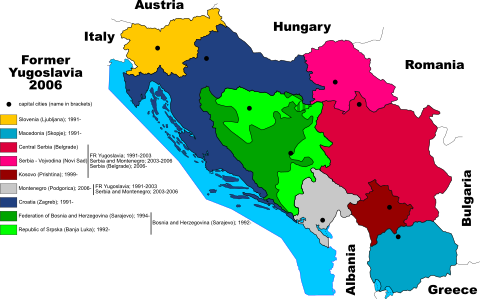 ↑ "History of Serbia: The Break-up of SFR Yugoslavia (1991–1995)". Serbia Info. ओरिजनल से 22 December 2007 के पुरालेखित. ↑ "United Nations Security Council Resolution 757" (PDF). United Nations. ओरिजनल (PDF) से 14 अगस्त 2011 के पुरालेखित. ↑ "United Nations General Assembly Resolution A/RES/47/1" (PDF). United Nations. ओरिजनल (PDF) से 14 अगस्त 2011 के पुरालेखित. ↑ "World Briefing – Europe: Serbia: Going Solo". The New York Times. 6 जून 2006. ↑ Schneider, Daniel B. (29 जून 2006). "World Briefing – Europe: Montenegro: U.N. Makes It Official". The New York Times. ↑ "World Bank Group Members". World Bank. ओरिजनल से 2011-02-19 के पुरालेखित. ↑ 50.0 50.1 John R. Bolton (1 July 2000). "New Directions for the Chen Administration on Taiwanese Representation in the United Nations". China Affairs Quarterly. American Enterprise Institute for Public Policy Research. 1: 29. ↑ "United Nations General Assembly Resolution A/RES/48/258" (PDF). United Nations. ओरिजनल (PDF) से 24 September 2012 के पुरालेखित. ↑ 53.0 53.1 Gharib, Ali (20 December 2012). "U.N. Adds New Name: "State of Palestine"". The Daily Beast. पहुँचतिथी 10 January 2013. ↑ United Nations General Assembly Session 58 Resolution 314. Participation of the Holy See in the work of the United Nations A/RES/58/314 2004-07-16. Retrieved 2016-04-24. ↑ United Nations General Assembly Session 29 Resolution 3237. Observer status for the Palestine Liberation Organization A/RES/3237(XXIX) 1974-11-22. Retrieved 2016-04-24. ↑ United Nations General Assembly Session 43 Resolution 177. Question of Palestine A/RES/43/177 1988-12-15. Retrieved 2016-04-24. ↑ United Nations General Assembly Session 66 Agenda item 116. Application of Palestine for admission to membership in the United Nations A/66/371 2011-09-23. Retrieved 2016-04-16. ↑ "General Conference admits Palestine as UNESCO Member State". United Nations Educational, Scientific and Cultural Organization. 31 अक्टूबर 2011. ↑ United Nations General Assembly Session 67 Resolution 19. Status of Palestine in the United Nations A/RES/67/19 2012-12-04. Retrieved 2016-04-24. ↑ "Palestinians win implicit U.N. recognition of sovereign state". Reuters. 29 November 2012. पहुँचतिथी 29 November 2012. ↑ "UN makes Palestine nonmember state". 3 News NZ. 30 November 2012. ↑ "Israel defies UN after vote on Palestine with plans for 3,000 new homes in the West Bank". The Independent. 1 December 2012. ↑ "Malta Permanent Mission to the United Nations". Un.int. पहुँचतिथी 12 April 2016. ↑ "What is a Permanent Observer?". United Nations. ↑ Osmańczyk, Jan (2003). Mango, Anthony, संपा. Encyclopedia of the United Nations and International Agreements (3rd संपा.). Routledge. ISBN 0-415-93920-8. ↑ McNeely, Connie L. (1995). Constructing the Nation-State: International Organization and Prescriptive Action. Greenwood Publishing Group. पप. 44–45. ISBN 978-0-313-29398-6. ↑ "About the EU at the UN – European Union Delegations". Europa. ओरिजनल से 4 September 2006 के पुरालेखित. पहुँचतिथी 22 September 2011. ↑ "Resolution adopted by the General Assembly: Participation of the European Union in the work of the United Nations" (PDF). United Nations. ओरिजनल (PDF) से 8 December 2013 के पुरालेखित. पहुँचतिथी 22 September 2011. ↑ "About the EU at the UN". Europa. ओरिजनल से 12 February 2008 के पुरालेखित. पहुँचतिथी 22 September 2011. ↑ "Non-Self-Governing Territories". United Nations. ↑ "Member States". United Nations Educational, Scientific and Cultural Organization. ओरिजनल से 8 July 2012 के पुरालेखित. ↑ "NZ PM rules out discussion on Cooks UN membership". Radio New Zealand. 2015-06-19. पहुँचतिथी 2016-04-16. ↑ "Niue to seek UN membership". Radio New Zealand. 2016-10-27. पहुँचतिथी 2017-07-08.